lilac lane, originally uploaded by jahansell. There really is a Lilac Lane in Sharon, but this isn't it - I haven't been down the other one. 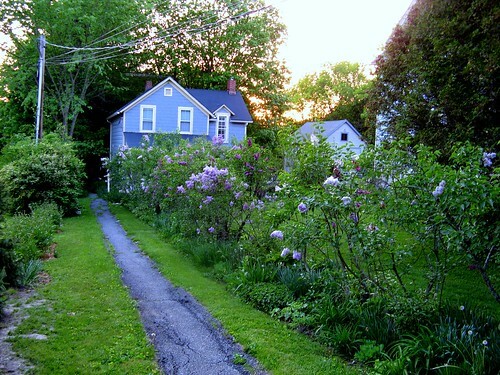 This one is just someone's driveway, lined with fragrant lilacs in every shade from white to dark purple. I have only one lilac, myself, and it hasn't bloomed this year - I think because I transplanted it last fall. It looks healthy and happy, just no flowers! Alas, maybe next year! So pretty and I love the colour of the house. So weird I live in Cherrytree Road but there are no cherrytrees...yet there are cherrytrees in Sycamore Road just round the corner. Yes, me too, struck by that wonderful blue house! Coincidence in our 5/29 posts & the colour lilac, at least! I went in strong! Lilac is really one of the emblematic blossoms of the season, isn't it? Do you have acacia in Sharon? I don't know what acacia looks like so I don't know if we have it! We too are missing bees - my friend Randy's entire hive died, twice! Bees are important for our nation's food crops. We are given four years to find a solution or be dead from starvation. Albert Einstein said that or words to that effect. I wrote about this several times since coming here. No honey bees on my little white Dutch clover means it is thinning out because it is not pollinated, it dies back more each year. We can live without lilac bushes but their demise would be disturbing for a variety of reasons. We can also live without whales but Japan still kills them every day of every year and the collective world never raises one finger in protest. The same kinds of things can be said about pesticides killing insects that could pollinate lilac bushes and food crops, but nobody says much about indiscriminate killing most pesticides are guilty of. Most respond with something like, "I hate ants," or "I hate spiders," and never realize that pesticide use also kills pollinators and would-be pollinators. A lilac bush is only the tip of the environment's melting icebergs. Having said all that, the photograph does show most of the lilac bushes in flowers of multi-colors so there is hope that more will bloom next year. As for my little Dutch clover disappearing, I can blame that on the lack of honey bees. what a great idea--to create a llac walk--and the house of blue-- wow!